I've talked before about my two main printmaking disciplines (Intaglio & Relief) in college and how they informed my growth as an artist. But I wanted to share a process I only used a few times in practice that combined the two techniques for Itaglio (printing from ink underneath the surface of the 'plate') and relief (printing from on top of the surface of the 'plate'. 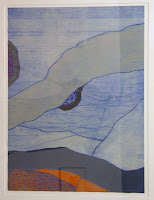 My Printmaking professor at Mott Community College, Sam Morello, showed us a piece of his work when it was on display for an exhibition in Flint. Normally he wouldn't have shared his work with us since he wanted us to be uninfluenced by his work and only influenced by his teaching. The piece pictured here wasn't the piece he showed us, but similar. He was also vague about how the image was made. With a bit of pressing he gave enough details for those of us inspired to figure it out. 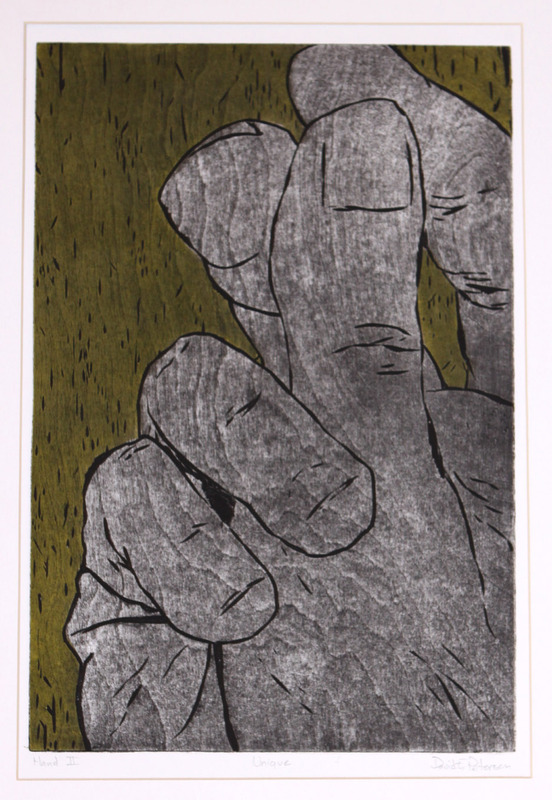 At Eastern Michigan University, I decided to try the technique in one of my last semesters as a printmaking student. 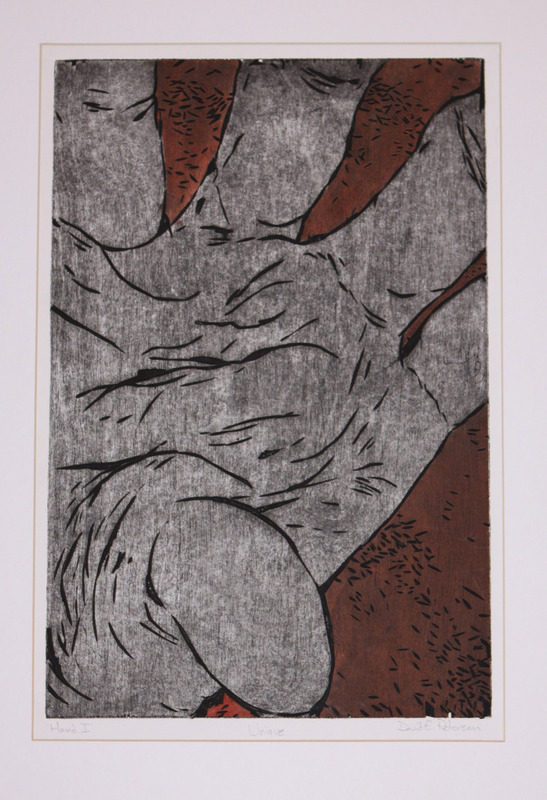 The process goes something like this, in a woodblock, you carve lines like a contour line drawing (I chose to do drawings of hands in odd positions and cropped awkwardly). The block is then inked and wiped like an etching, meaning the ink settles down into the cuts below the surface of the uncarved wood block. All of the wood grain also act as tiny etched lines and the ink gets wiped down into them as well. 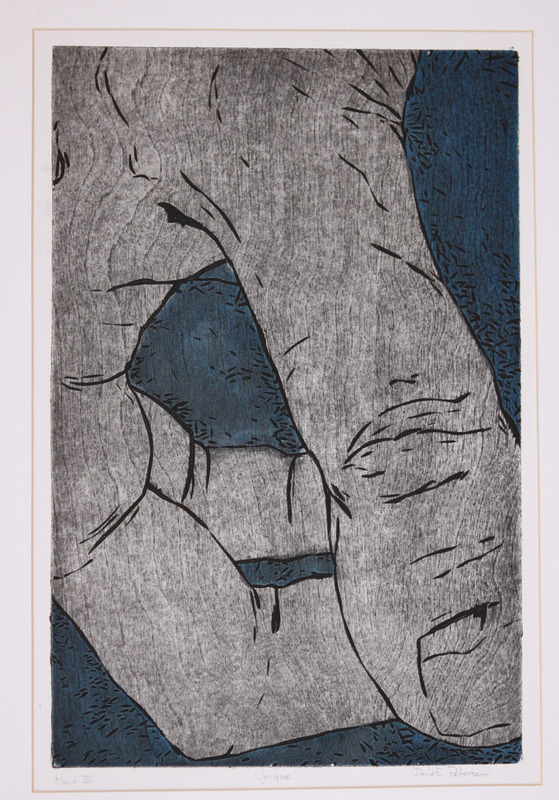 As a last step before printing, you can add areas of flat color with a brayer (ink roller) like you would with a woodblock print. The colored ink sits up on top of the block. Making this technique a mix of Intaglio & Relief printing. Unknown to me at the time, some past students at Eastern had broken the press by running wood through it when they didn't also adjust the press for the correct pressure/tolerance settings. So I had no hesitation to adjust the press for my test runs of the prints, but when I put the proofs up for critique the professor was very upset I had run wood through the press. I explained I knew how to correctly adjust the press and he didn't sway, I asked him to adjust the press for me and we could run them together under his supervision, he didn't sway. I explained that these pieces were the majority of my work for the semester, and I had little else to turn in as a final, he didn't sway but re-iterated that by no means was I to run wood through that ever press again. I called Sam. He had retired from teaching by then, but had a basement studio and a press he was willing to supervise me using. He and I printed the images I've shared above and when I turned the work in at Eastern for a final grade I was able to do so with out having broken any rules. I was questioned by the EMU professor at the final portfolio review as to how I printed them. I promised that it wasn't done on school grounds. He seemed uncertain and not pleased I still turned this work in...until the head of the art department walked in by chance, saw the work, and was very excited about my images & wanted to know more about the process. The head of department's enthusiasm forced my professor to put on a smile and grade the work based on merit rather than the backstory of how & where it was made. 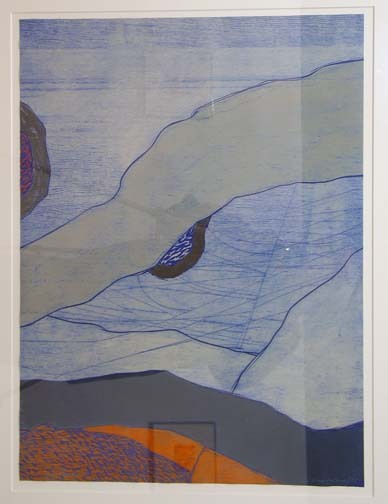 To add insult to injury for the professor, the head of department asked if I wouldn't mind loaning the artwork to them for their summer showcase. 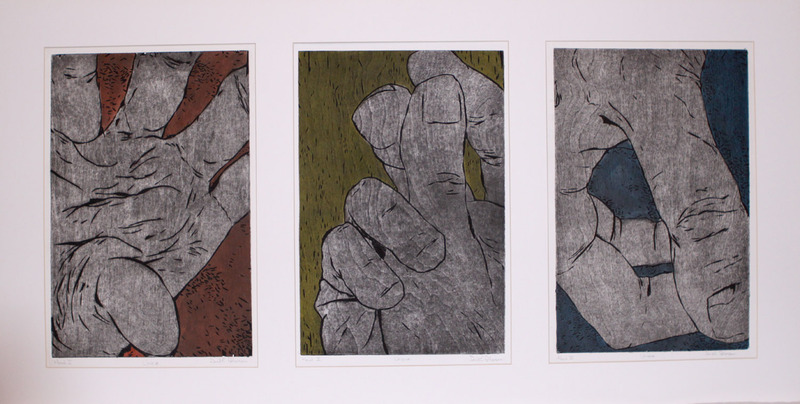 The Hands Triptych now lives in our spare bedroom. 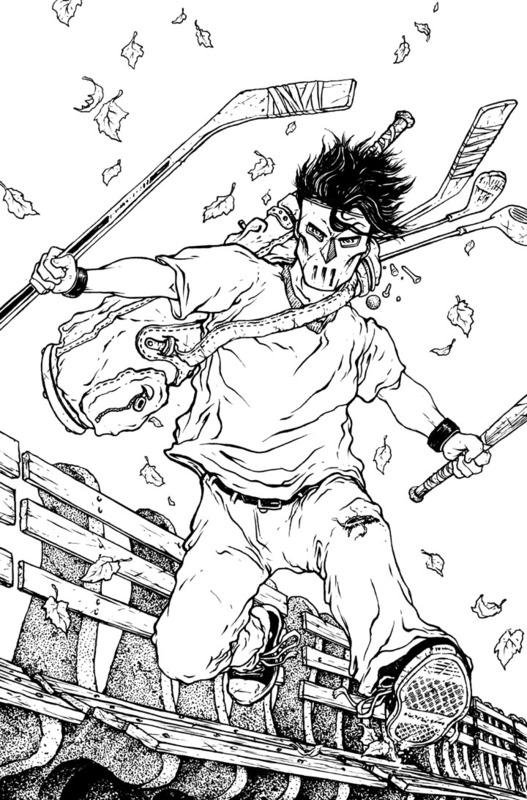 Cover number 6 of 8 TMNT micro-series covers I'm doing for IDW is Casey Jones. 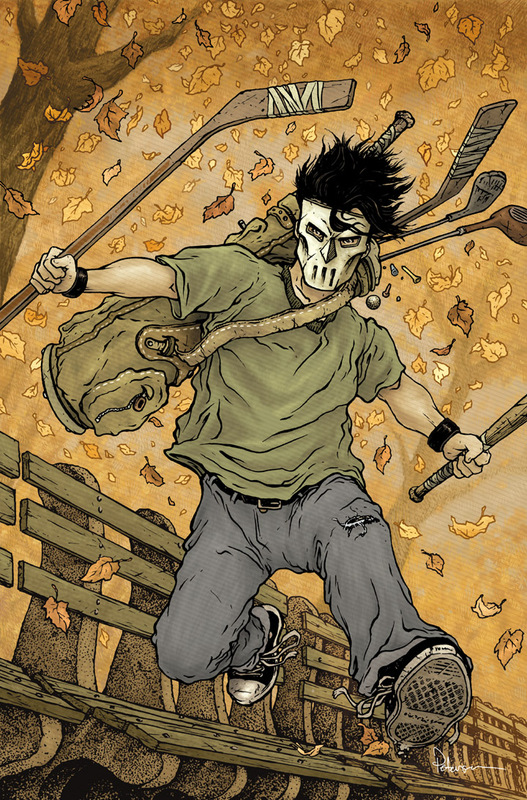 Not as familiar with both Casey in the new IDW series and with drawing humans in general, I talked over the cover with my editor Bobby Curnow. 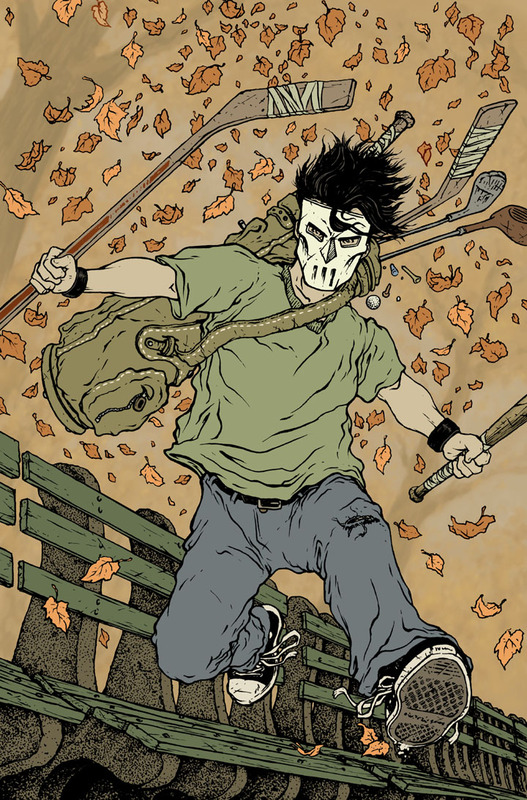 We established that Casey running through someplace in Central Park with vigilante sports equipment in-tow would be just the ticket. I referenced a few photos of hurdlers to get the pose, but found that professional hurdlers have too good of form to be convincing as teenager/vigilante Casey Jones...so I found a photo of a kindergarten field day where a 5 year old was leaping over a hurdle and it was the perfect form for Casey. I sketch out the figure on one page of my sketchbook and some benches on another. 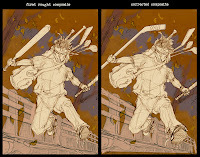 In photoshop I compositied the drawing of Casey with the drawing of some park benches. At this stage I also did some quick lay-ins for how the tone of the piece was going to be and to fill in the background a bit. I told Bobby when I sent this in for approval that I'd be doing some digital painting for the background. 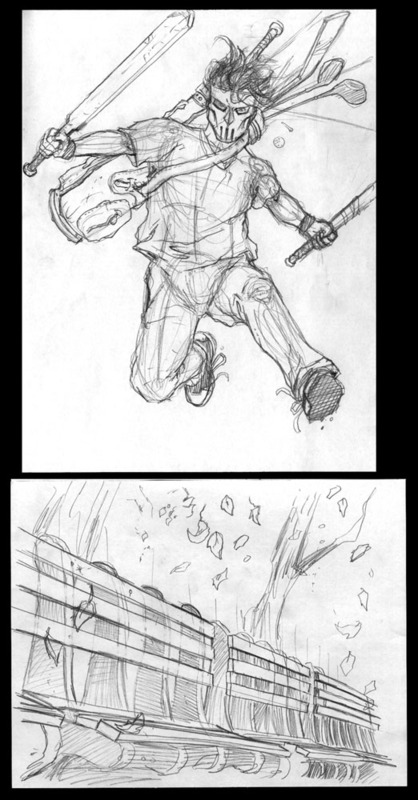 I did get some notes on the rough cover, but they had to do with changing Casey's legs and replacing the cricket bat with a hockey stick. 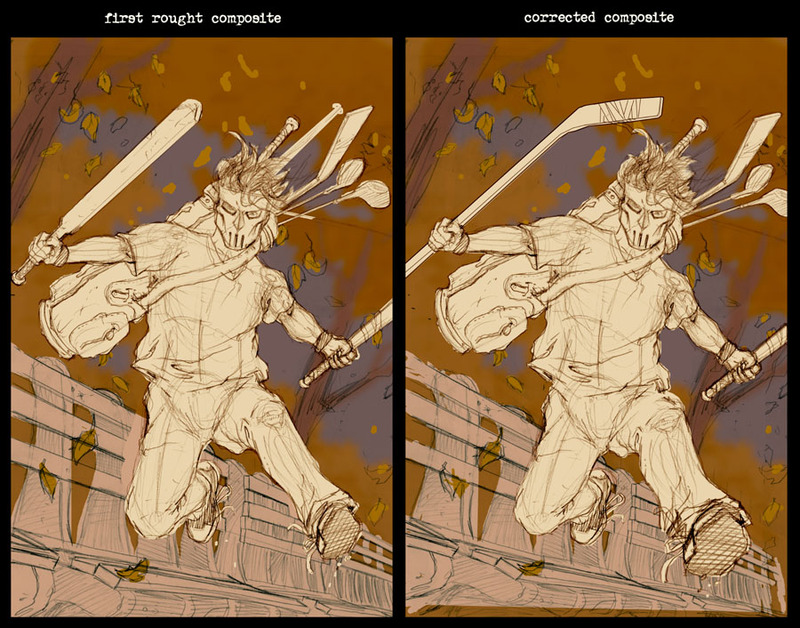 I took the opportunity to enlarge Casey a bit and rotate him to make the pose & layout more dynamic. The inks for this piece went rather smoothly. I used a printed version of the above layout on the lightbox to ink this on bristol board. Normally for folds in fabric, I'm drawing mice in cloaks and use stippling, but here I just concentrated on some well placed contour lines. The most difficult part of the inking process was the tread of that oncoming shoe. I wanted it to read as true to being a converse all-star, but also to not be so detailed that you couldn't believe it is in motion. Something about how painless this piece was to ink should have given me warning...but it didn't. The next step was to flat the colors and start that digital painting...oh...there is the problem...I don't really digitally paint much...I relly on hard ink outlines to guide my color work...uh-oh. 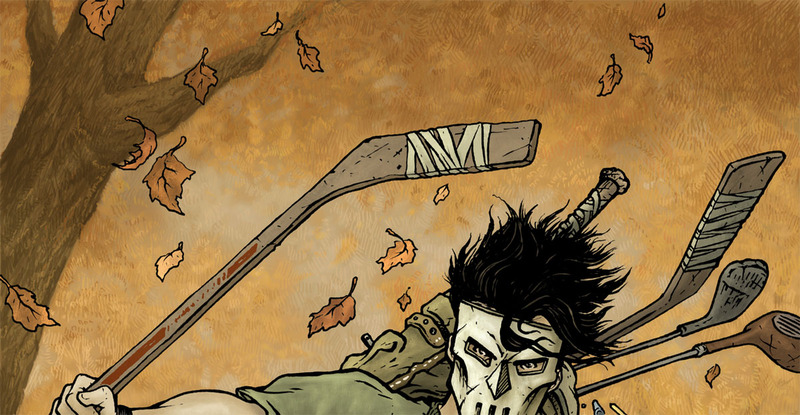 After several attempts to get the painted background to look right in the same image as my hard linework, I opted to add more falling leaves as a background cover-up and distraction. Here you can see the background still in process, but with newly added drawn & inked leaves I patched in. I drew that batch of leaves on a separate sheet of paper...still wasn't doing the trick though. I'm showing the process out of order a bit. Here is the final rendered cover, with crosshatched background, but by the time I was doing the hatching, I had already rendered the figure of Casey, the benches, and that golf bag. This cover took a lot out of me. I don't know if I conveyed the self-doubt I had while working on this piece in my blog-write-up...but it was crushing. I spent more time on fixing that background than it usually takes me to do a cover from start to finish. But I'm happy enough with it to have turned it in, and IDW and Nickelodeon were both happy enough to approve it! 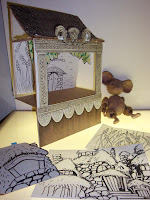 Not wanting to repeat the bed-time-story setup from last year's offering, I chose to tell the story to Saxon by having him watch a puppet show. 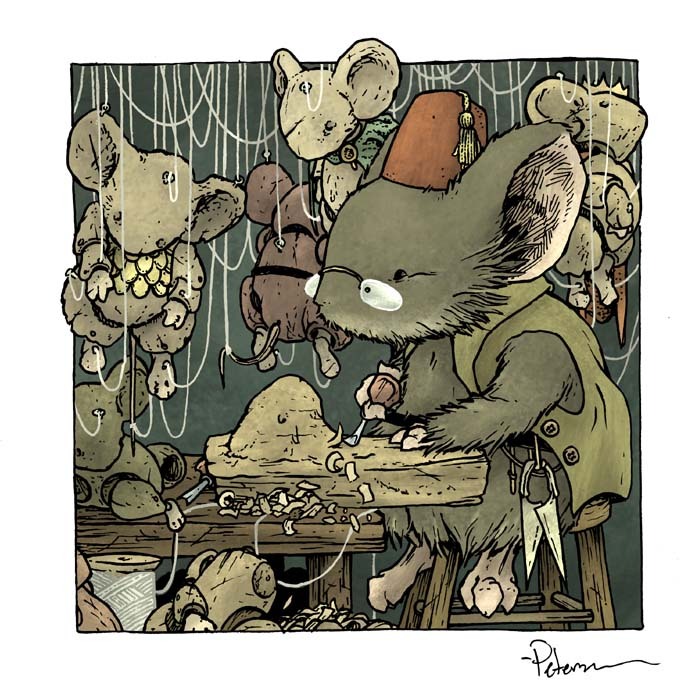 The idea had come to me early last year when I drew this piece of a mouse puppet maker. 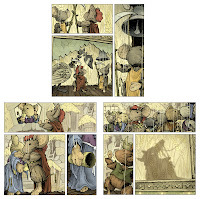 I love puppets and puppetry, so I thought mice telling stories with puppets would be a wonderful way for them to tell tales, make art objects, and charming for the readers of my books. The fez & vest of this mouse puppet builder is an homage to the Fraggle I made as an analog of myself named Gib. 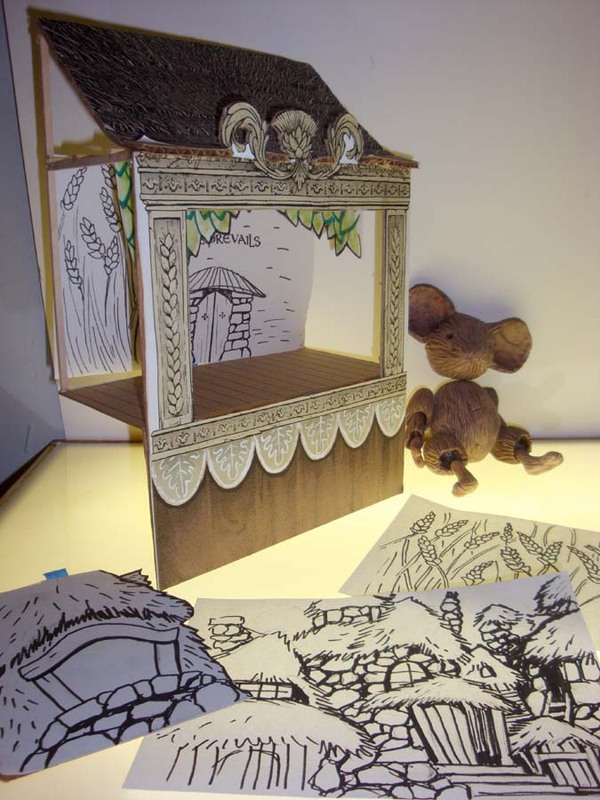 So, I proceeded with the idea to tell the whole story using marionettes. 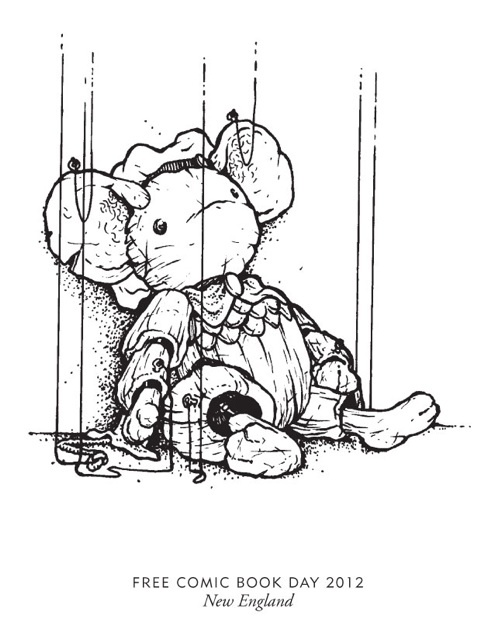 As a side note, I did pause for a moment to realize, I wasn't planning to use the puppets as a gateway into showing the 'real' story, but would illustrate the puppets on stage as you would see them if you were in the mouse audience....it still seems like a gamble to have only drawn 'real' mice in only 2 panels of my story, but I liked the immersion into the storytelling method. The story itself was all built around a way for me to impress on Saxon that he should become the mouse who doesn't pause and hesitate at the thought of danger, that he should be a mouse willing to leap into peril for the good of mice, and that this bravery and daring-do pay off in the end. I thought of the quote from Edmund Burke, "All that is required for evil to prevail is for good men to do nothing". And mousified it to "Evil Prevails if Good Mice Do Nothing". And then it's easy to imagine Saxon perverting that into his leaping into everything wards off evil. To prepare for drawing this story, I built a few props as guides for me. I printed out the stage proscenium from my cover art for the book (done in advance of the story) and cut it up adding a few basswood sticks and cardboard to create a paper-stage model. I made a few backdrops and flying walls to scale for the stage so that each scene would be playing out in new locations while still seeming like a believable stage play. 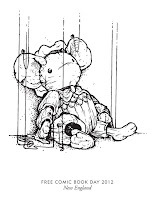 I also sculpted a mouse marionette that I could pose for reference to get the joints and weight of the lifless limbs correct..
Baldwin (our puppet hero...and named after my Paternal Grandmother's Maiden surname) overcomes three obstacles in the tale. He saves the village from starvation by cleverly trapping a greedy goose as bait for a wolf, he has the courage to speak to a pretty mouse before she chooses death over loneliness, and finally, with his bravery as an example, he leads the town to triumph in battle over the same wolf from earlier. The pattern of three is a classic fairy tale device, and I wanted to make sure the three tasks were not all solved by brute force or just by the tip of a sword. Even though this story was for Saxon, I opted to make Baldwin a bit more well rounded and used bravery to outsmart, love, and lead. I hope you all had a great Free Comic Book Day last weekend! 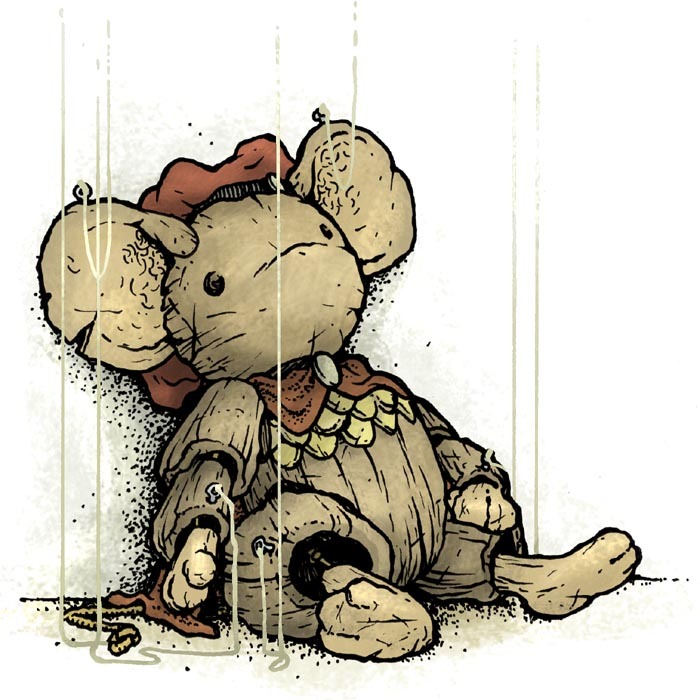 In case you didn't get a copy of the amazing hardcover Archaia put out, word is that you can contact them directly to try and obtain one. 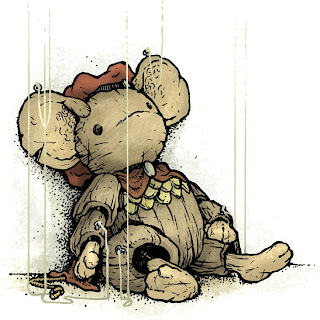 It really is a great book, and besides a new Mouse Guard story there is a Labyrinth story by Corey Godbey, Ted Naifeh, & Adrianne Ambrose, A Return of the Dapper Men story by Jim McCann & Janet K. Lee, a Rust story by Royden Lepp, A Cursed Pirate Girl story by Jeremy Bastian, and a Cowboy story by Nate Cosby & Chris Eliopoulos. Next Week's post will be about my process for creating this story. 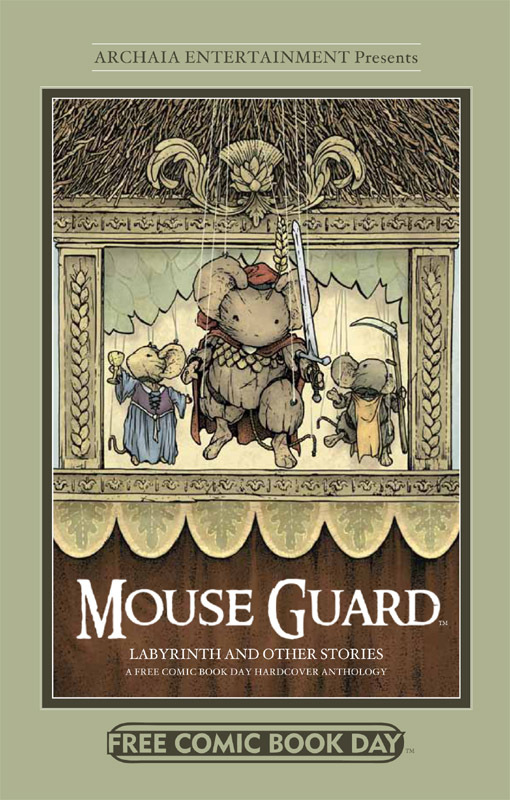 On Saturday May 5th I encourage you to seek out your local comic shop and pick up Archaia's AMAZING hardcover for Free Comic Book Day. -and a Mouse Guard story by me. From 9:30am-12:30pm I'll be at Larry's Comics in Lowell, MA. From 2pm-4pm I'll be at Jetpack Comics in Rochester, NH. Both stores will have a special tip-in bookplate for the event ,which are in very limited quantity from my understanding, and can be seen to the right. Check back next week for a similar video treatment to this year's FCBD story: The Tale of Baldwin the Brave.